Breaking News: 100 people turned up at Speakers’ Corner Thursday evening to mark 22nd anniversary of “Marxist Conspiracy”. TOC will carry a report of it soon. Breaking News: Ministry of Education releases Information Sheet on Ministry of Education’s Sexuality Education (SEd) Programme. On May 21st 1987, the government ordered the crackdown of 22 young social activists under “Operation Spectrum”. Amongst them were lawyers, social workers and members of the Catholic Church. They were accused and detained without trial for engaging in ‘communist united front tactics with a view to establishing a Marxist state.’ In actual fact, several of them were merely volunteers of the Workers’ Party which did not (and continues not to) subscribe to Marxist ideology in the first place. After they were released, some of the detainees issued a statement that ran counter to government denials that they had been tortured. They were promptly rearrested and were later released again only on condition that they signed statutory declarations denying everything they had said in the press statement. Lawyer, former Solicitor-General & ex-WP candidate for Eunos GRC (GE88) Francis Seow stepped in to represent one of the detainees who had sought his legal assistance. But when he arrived at the detention centre, he was himself detained by the ISD for more than two months. He was later charged and convicted in absentia for tax evasion. To this day, the 1987 Marxist Conspiracy remains an enigma. These ex-detainees did not fit into the Marxist stereotype; their behaviour was a direct contrast to the traits of fiery left-wing unionists and the passionate leaders of communist-inspired labour and students’ movements in the 50s & 60s. The ex-detainees comprised of highly educated and intelligent young citizens. 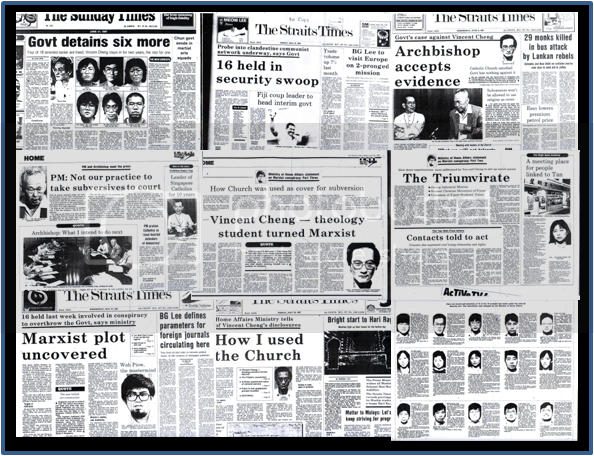 The accused mastermind, Vincent Cheng, was a social worker with the Roman Catholic Church and was at one stage studying to be a priest. He spent nine years in the seminary. It’s hard to imagine a man with deep-rooted connections to the Church associating himself with an atheistic Marxist movement. Since Mr Tharman should by now have more access to state intelligence, perhaps it would be good for him to shed new light on this matter. Otherwise one cannot help but conclude that in the alleged 1987 Marxist Conspiracy, the government was actually more fearful about political activism with links to God-related institutions than alleged links with the anti-God Marxist movement. Political activism and religion certainly should not mix because Singapore is a multi-racial and religious society. Yet there appears to be a contradiction in the government’s rationale for the 1987 arrests, since Marxism and Catholisim are ideologically diametric. Contentions aside, I recently bought and read two books penned by victims who had suffered detention without trial under the Internal Security Act. My mind lingered over the thoughts and meaning of each printed word and sentence in the books. Overall both books are very solemn reads; they record the thoughts of political detainees who were supposedly free citizens of a parliamentary democracy. It is very heart-wrenching for me to picture the sufferings those detainees went through. 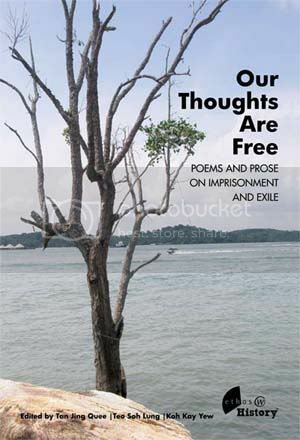 The other book, Our Thoughts Are Free, includes touching poems & prose detailing various aspects of the ex-political detainees’ thoughts and raw emotions. I was immensely touched by several poems penned by Teo Soh Lung that described her time in solitary confinement. My heart cried out for their cruel detention without trial and the sufferings they went through under interrogation. The silent timelessness, the mundane routines of cell life, is one of the worst forms of torture, one that supposedly breaks minds & souls. From personal contacts, I came to know that several of the 22 victims chose to stay rooted to Singapore. The fact that these people chose to stay on in Singapore, continued with their lives and publishing their plight in words strongly suggests their innocence. In the light of the accounts of the 22 ex-detainees, the question remains – was the government just in applying an iron fist against 22 young volunteer workers, when the only threat, if any, they posed was social activism? If the answer is “NO”, then the least the state can do is to issue an apology to each of the victims of the alleged Marxist Conspiracy. Since the investigations and detention were out of public scrutiny, then it may be time for the government to appoint an inquiry, to ascertain the truth and clear the names of the victims once & for all and work out details of monetary compensation for the dishonour, anguish and sufferings they have gone through. In practical terms, no amount of apology or compensation can ever erase the sufferings of the victims. Yet, if the government had indeed been wrong, it should not shy away from admitting its honest mistakes; it should be open about it and directly seek forgiveness from the victims. With the world still very much preoccupied with a post 9-11 mentality, counter-terrorism legislations in the name of national security is the norm. The mandate of the Internal Security Act and its related apparatuses in Singapore has evolved. It has been applied with an iron hand against alleged terrorists, justified via the necessity to preempt would be acts of terror. I am of the view that the ISA, which provides for detention without trial in cases of alleged subversion, should be abolished. Singapore should be brought in line with international practices to try such cases, including espionage, with modified procedures to protect official secrets if necessary. In cases of alleged terrorism, the government should be enabled by a specific anti-terrorism law to make swift arrests and detain suspects. However, these suspects must be afforded due process to challenge the legality of their arrests through the courts and possibly an Advisory Board, which should have powers to order a release of the person if it is not satisfied as to the basis of the detention. The victims’ accounts have saddened me deeply. However they have concurrently inspired me. The harsh treatment they had suffered are deeply enshrined in my heart and my mind, reaffirming my conviction that political hegemony is bad and a credible political defense must be in place to prevent such a tragic episode from ever happening again. As we mark the 22nd anniversary of the alleged Marxist conspiracy arrests, may the victims’ accounts continue to inspire a new generation of activists and activists-to-be. Yaw Shin Leong is the Organising Secretary of the Workers’ Party. The above article is written in his personal and private capacity. Lim, Lydia and Li, Xueying, The Legacy of 1987, Insight. Singapore: The Straits Times, 07/07/07. Fong, Hoe Fang, ed. 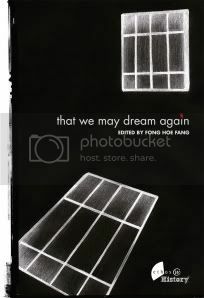 That We May Dream Again. Singapore: Ethos Books, 2009.